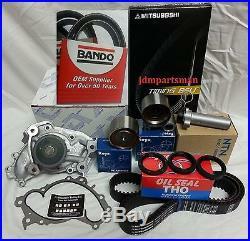 OEM COMPLETE TIMING BELT DRIVE BELT WATER PUMP KIT TOYOTA LEXUS V6 1MZFE. BANDO AC BELT K060410 / 6PK1045/40(pictured above is a Mitsuboshi belt). BANDO PWR STEERING BELT K040347 / 4PK880 / 85 / 75 (pictured above is Mistuboshi belt). 1994 LEXUS ES300 3.0L V6 ABS. 1994 LEXUS ES300 3.0L V6 W/O ABS. 1994 TOYOTA CAMRY 3.0L V6 ABS. 1994 TOYOTA CAMRY 3.0L V6 W/O ABS. 1995 LEXUS ES300 3.0L V6 ABS. 1995 LEXUS ES300 3.0L V6 W/O ABS. 1995 TOYOTA AVALON 3.0L V6 ABS. 1995 TOYOTA AVALON 3.0L V6 W/O ABS. 1995 TOYOTA CAMRY 3.0L V6 ABS. 1995 TOYOTA CAMRY 3.0L V6 W/O ABS. 1996 LEXUS ES300 3.0L V6 ABS. 1996 LEXUS ES300 3.0L V6 W/O ABS. 1996 TOYOTA AVALON 3.0L V6 ABS. 1996 TOYOTA AVALON 3.0L V6 W/O ABS. 1996 TOYOTA CAMRY 3.0L V6 ABS. 1996 TOYOTA CAMRY 3.0L V6 W/O ABS. 1997 LEXUS ES300 3.0L V6 W/O TRC -97.03. 1997 LEXUS ES300 3.0L V6 W/O TRC 97.03. 1997 TOYOTA AVALON 3.0L V6 ABS -97.03. 1997 TOYOTA AVALON 3.0L V6 ABS 97.03. 1997 TOYOTA AVALON 3.0L V6 W/O ABS -97.03. 1997 TOYOTA AVALON 3.0L V6 W/O ABS 97.03. 1997 TOYOTA CAMRY 3.0L V6 ATM. 1997 TOYOTA CAMRY 3.0L V6 MTM. 1998 LEXUS ES300 3.0L V6 W/O TRC. 1998 TOYOTA AVALON 3.0L V6 ABS. 1998 TOYOTA AVALON 3.0L V6 W/O ABS. 1998 TOYOTA CAMRY 3.0L V6 ATM. 1998 TOYOTA CAMRY 3.0L V6 MTM. 1998 TOYOTA SIENNA 3.0L V6. 1999 LEXUS ES300 3.0L V6 W/O TRC. 1999 LEXUS RX300 3.0L V6 AWD. 1999 LEXUS RX300 3.0L V6 FWD. 1999 TOYOTA AVALON 3.0L V6 ABS. 1999 TOYOTA AVALON 3.0L V6 W/O ABS. 1999 TOYOTA CAMRY 3.0L V6 ATM. 1999 TOYOTA CAMRY 3.0L V6 MTM. 1999 TOYOTA SIENNA 3.0L V6. 1999 TOYOTA SOLARA 3.0L V6 ATM. 1999 TOYOTA SOLARA 3.0L V6 MTM. 2000 LEXUS ES300 3.0L V6. 2000 LEXUS RX300 3.0L V6 AWD. 2000 LEXUS RX300 3.0L V6 FWD. 2000 TOYOTA AVALON 3.0L V6 ABS. 2000 TOYOTA AVALON 3.0L V6 W/O ABS. 2000 TOYOTA CAMRY 3.0L V6 ATM. 2000 TOYOTA CAMRY 3.0L V6 MTM. 2000 TOYOTA SIENNA 3.0L V6. 2000 TOYOTA SOLARA 3.0L V6 ATM. 2000 TOYOTA SOLARA 3.0L V6 MTM. 2001 LEXUS ES300 3.0L V6. 2001 LEXUS RX300 3.0L V6 AWD. 2001 LEXUS RX300 3.0L V6 FWD. 2001 TOYOTA AVALON 3.0L V6 ABS. 2001 TOYOTA AVALON 3.0L V6 W/O ABS. 2001 TOYOTA CAMRY 3.0L V6 ATM. 2001 TOYOTA CAMRY 3.0L V6 MTM. 2001 TOYOTA SIENNA 3.0L V6. 2001 TOYOTA SOLARA 3.0L V6 ATM. 2001 TOYOTA SOLARA 3.0L V6 MTM. 2002 LEXUS RX300 3.0L V6 AWD. 2002 LEXUS RX300 3.0L V6 FWD. 2002 TOYOTA AVALON 3.0L V6 ABS. 2002 TOYOTA AVALON 3.0L V6 W/O ABS. 2002 TOYOTA SIENNA 3.0L V6. 2002 TOYOTA SOLARA 3.0L V6 ATM. 2002 TOYOTA SOLARA 3.0L V6 MTM. 2003 LEXUS RX300 3.0L V6 AWD. 2003 LEXUS RX300 3.0L V6 FWD. 2003 TOYOTA AVALON 3.0L V6 ABS. 2003 TOYOTA AVALON 3.0L V6 W/O ABS. 2003 TOYOTA SIENNA 3.0L V6. 2003 TOYOTA SOLARA 3.0L V6. 2004 TOYOTA AVALON 3.0L V6 ABS. 2004 TOYOTA AVALON 3.0L V6 W/O ABS. Exceeds manufactures stress tolerances for superior performance. Designed with the factory specifications in mind, for an accurate fitment. Guaranteed against workmanship and material defects. Part number is specific to the vehicle's year, make and model. Sellers: Add a FREE map to your listings. The item "GENUINE/OEM COMPLETE TIMING BELT DRIVE BELT WATER PUMP KIT TOYOTA LEXUS V6 1MZFE" is in sale since Monday, October 08, 2012. This item is in the category "eBay Motors\Parts & Accessories\Car & Truck Parts\Engines & Components\Timing Components". The seller is "jdmpartsman714" and is located in Costa Mesa, California.